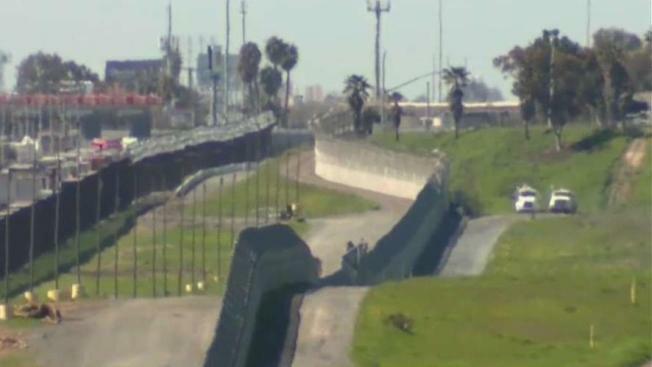 More construction is underway in Otay Mesa for President Donald Trump’s secondary border fence replacement project. On Friday U.S. Customs and Border Protection officials took journalists on a tour of the new barrier which is twice the size of the original. “What we're looking for is time so we can make the arrest,” said U.S. Border Patrol agent Theron Francisco. The new fence is 30 feet high, double the size of the fencing that's been in place since 1997. “30 seconds doesn't give us much time to respond to an event or some people trying to cross illegally, this new secondary project will allow us a lot more time and deter a lot more people due to the sheer size of it,” agent Francisco said. Crews are working to replace about 12-and-a-half miles of the secondary fencing and add an additional one-and-a-half mile of brand new secondary fencing. The $131 million project is using steel bollard which Officer Francisco explains will make it harder for people illegally crossing. Critics of the border wall tell NBC 7 that barriers are not the solution. “Preventing people from crossing is not really going to occur, it's just going to push people to much more dangerous areas where they are going to lose their lives,” immigration activist Pedro Rios said. Agent Francisco said the barriers themselves won't prevent tunnels from being constructed underground, but technology combined with the fencing may help agents detect them. “We have stadium-style lighting, camera technology, we have other roads on both sides, we have sensors. It’s not just the walls, it's the technology and amount of power in between that make it a whole system,” he said Francisco. A CBP spokesperson said the border wall prototypes are in the way of the secondary barrier project and will soon be coming down to allow the project to be completed. This project is expected to be done by early 2020.